I was recently in Chiang Mai, a city in northern Thailand, where I spent a month visiting silversmiths and chasers to document their work. The city is teeming with chasers, and there are whole temples covered in metalwork. The chasers work mostly in aluminum for cost reasons, although they sometimes work in silver. The average wage here is about $8-12 a day, and so tools that Western goldsmiths would take for granted are a serious expense to a Thai jeweler. 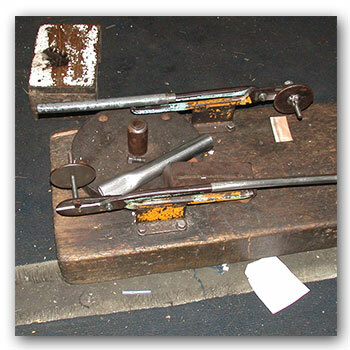 Limited tooling is normal, and the tools these chasers do have are often made from all kinds of things. I’ve highlighted below several examples of how these Thai chasers have solved their tool problems, and I think they’re a great reminder to us that being smart can save you money while letting you keep working even when you don’t have the right tool on hand. In case you ever need snips and don’t have them these homemade ones are great. Made just by connecting two pieces of thick sheet steel together with a bolt and nut, they work well for short cuts. I have seen versions of this in German and British workshops as well. It’s nice to know that it is so easy to make a pair of snips. Everyone knows that the more leverage you have the easier it is to use cutting tools for thicker metal. 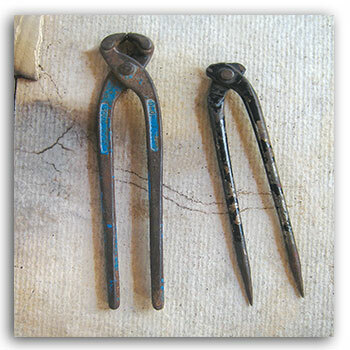 I came across a pair of snips at a chaser’s workshop with welded-on extension arms. An excellent addition to the tool, the arms offer significant added strength to the user. I also found similar long-handled snips in a Bangkok metal refinery. As shown above, they had been welded to mounting plates that attach them to a board. A hole had been drilled in one jaw to allow a threaded bolt to be attached, a nut holding it in place. Then a steel disc had a hole drilled in it, and a nut welded over the hole, so that it could be turned onto the bolt. This produces an adjustable stop plate that can quickly be set to different distances depending on the length of the wire or strip that you want to repeatedly and accurately cut. I had found the same solution myself years ago for a production snipping problem. When the steel to make a hammer costs more than a day’s wage, you find ways to reduce the cost. 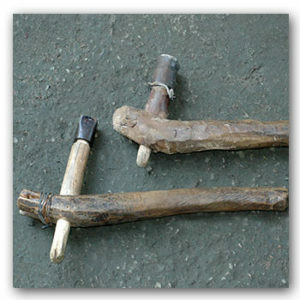 An older style Thai planishing hammer can be made by force-fitting a steel cup end onto the carved peg of a wooden hammer handle. 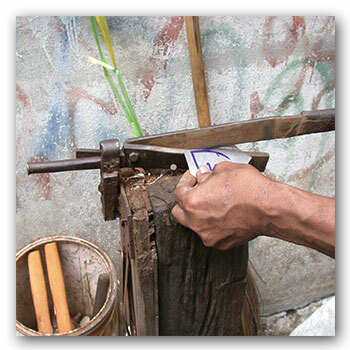 This means significantly less steel is used, which keeps the cost down, and it also makes for an extremely light, responsive wooden hammer that gives great control for fine planishing and finishing. At Direk Sintegarn’s workshop I noticed a great pair of dividers for scribing a circle. They were heavy, solid, and well made. I told them how nice they were and amid laughter was shown what they were made from—a broken pair of end cutters. 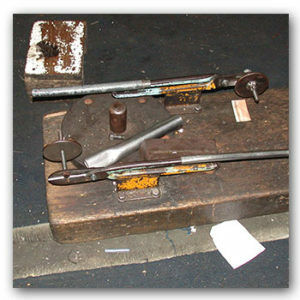 They had simply ground off the cutter end, ground and tapered the handles, and then hit the rivet a little tighter to make the dividers. 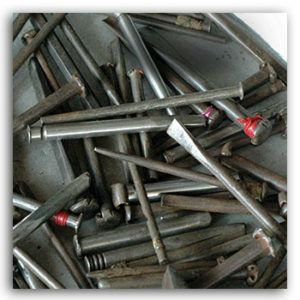 In the third world, from Mexico to Asia, the valve stem from a car’s engine is the preferred steel from which to make chasing tools and punches. In Thailand, valve stems are valued highly, and steel types are often known not by their designation numbers, but by what part of the car they are from and what kind of work that steel is good for.